It is important when you are choosing a surface for your hens runs to choose one that is suitable for the hens. Ideally you need a surface that encourages scratching as this will prevent boredom from setting in. Happy hens have far less health problems. When looking for a suitable surface you need to consider the following. BARK - this HOLDS water therefore your pen will become wetter if you put this down on the surface. More importantly it can hold a mold spore - ASPERGILLUS which is a mould that can cause respiratory problems. We have scoured the country for a suitable surface and have found a great HARDWOOD wood chip that is suitable for poultry. It is BARK FREE and therefore aids drainage. It has large pieces from 10mm - 40mm which helps prevent the chippings from becoming compacted and ensures they are long lasting. So if you have a fixed run and they are down to bare earth, sprinkle a good layer of this in the run and you will have happy hens! It can be left in situ - if you are wanting to sanitise the ground remember to use our Poultry Care disinfectant on the chippings and it will keep any bacteria at bay. Plastic sack holding 70 litres or weighing approx 18-20kg. 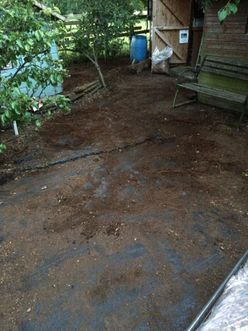 Estimate one sack will cover approx 10 sq ft or 1 square metre with a 3" depth. 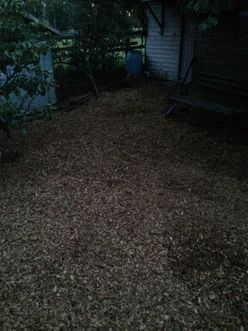 Our Woodchips are perfect for pathways as well. removing the old chippings and using them as a top dressing on our garden borders. Photo before - having removed the old woodchip.